Good Monday morning! Are you one of the fortunate people to have a three-day weekend? Did you do anything fun? We intended to go see a movie, but never made it. Have you seen the Lego Movie? If this movie was made when my boys were boys … pretty sure that they would have insisted on seeing it! I sprinkled the candy on some yummy cookie bars made with Snicker Bites, peanut butter chips and frosted with a thin layer of chocolate frosting! 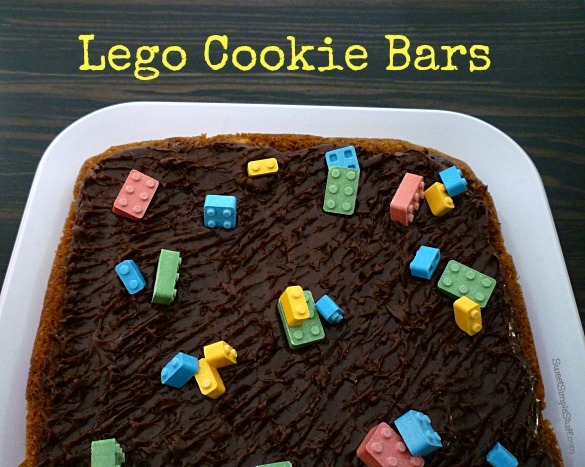 These cookies are made in a 9-inch square pan … perfect size and good chewy cookie with or without candy Legos 😉 BTW, the Lego candy tastes similar to Sweet Tarts. In a large mixing bowl, beat butter, sugars and vanilla until creamy. Add egg and beat well. Combine flour, baking soda and salt in small bowl. Gradually add flour mixture to sugar/butter mixture and beat well. 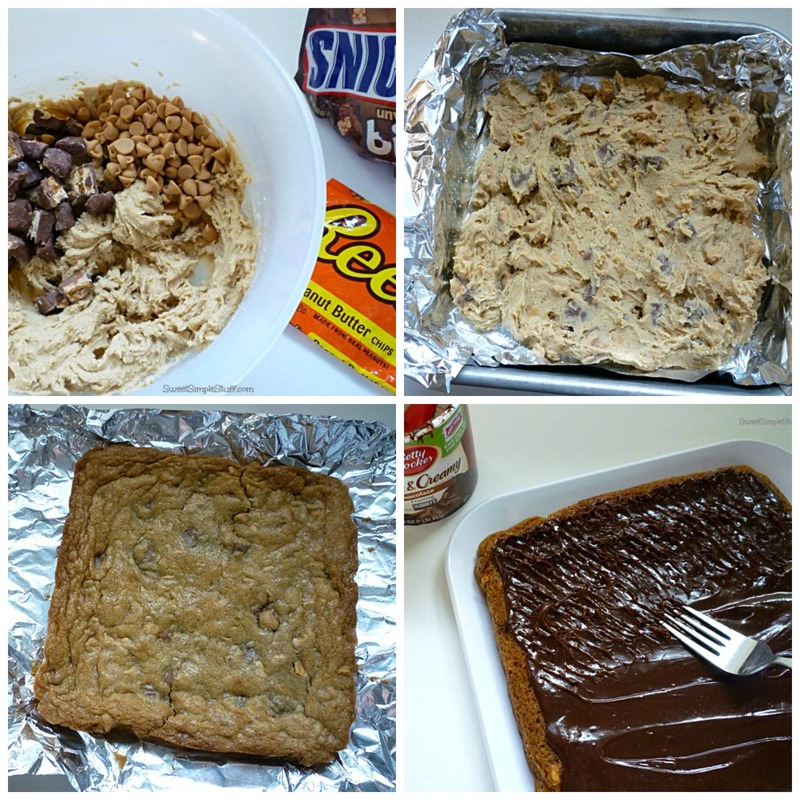 Stir in Snickers and peanut butter chips. Spread mixture in prepared pan. Bake 20-25 minutes or until golden brown. Allow to cool completely. Remove foil from pan and invert cookies onto serving plate, if desired. Place frosting in microwave for 10-20 seconds, stir well. 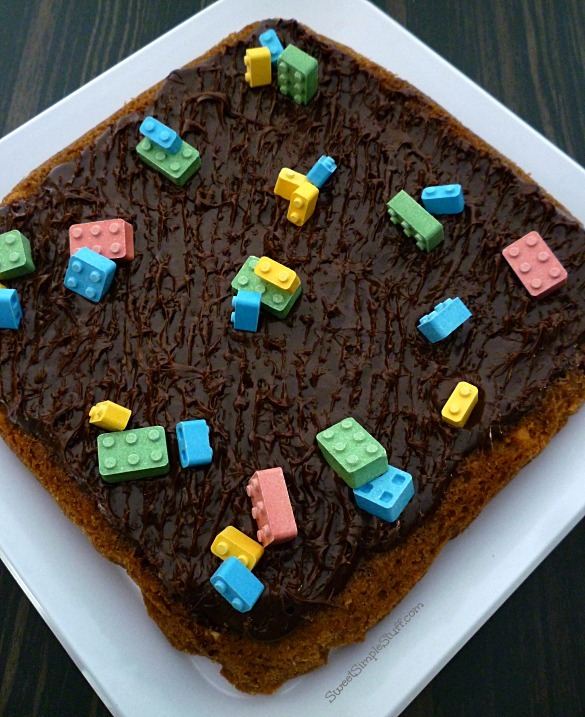 Spread the warm frosting over cookies, use a fork to create carpet looking texture, sprinkle with Lego candy, cut and serve! Makes 16 – 2″ squares. 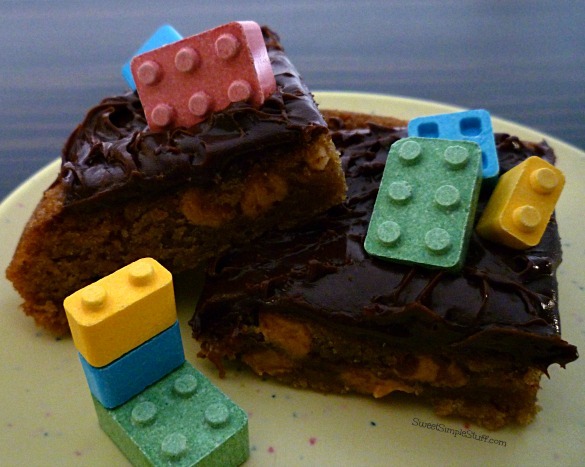 Are you a fan of Legos, Snickers, Peanut Butter Chips or Cookies? I remember stepping on my brother’s Legos. Ouch! I also lived in an apartment with orange shag carpet. Oh, it was just so stylish, lol! 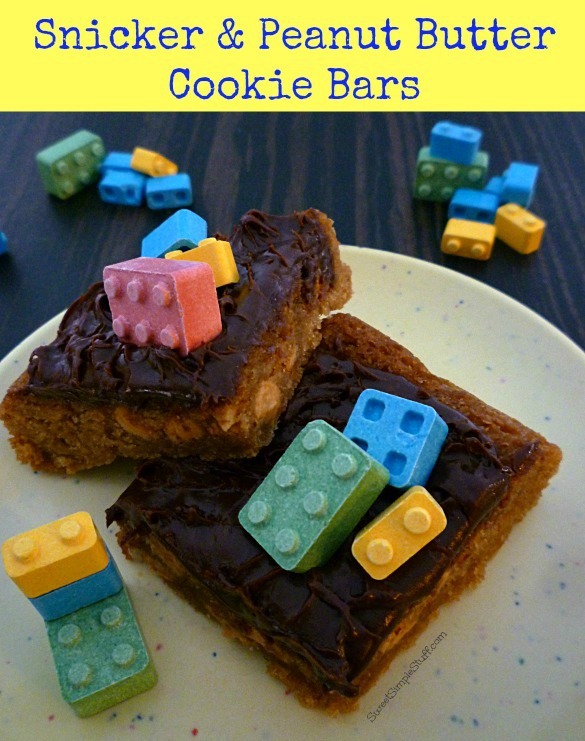 I’d much prefer to find my legos on yummy cookie bars. Thank you Beth 😉 Oh, we were so stylish … even had Harvest Gold kitchen appliances, LOL! Oh how I cursed the lego pieces when I stepped on them. Payback – now I can eat them! Brilliant!! Thanks Dinaz 😉 I never thought of it that way! I think the Lego’s candy’s are cute. Was so glad when our daughters out grew playing with lego’s. We always called them ‘landmines’ whenever we ended up stepping on one, or two. They are the best things to step on when barefoot. Thanks for the recipe and don’t step on any ‘landmines’. Thank you Colleen 😉 Landmines … perfect description! Holy cow these are amazing!! Jordan is totally into legos right now – but they have to be the girl version. God forbid they’re boy colors, lol! Thank you Dorothy 😉 I totally understand the boy vs. girl color thing!